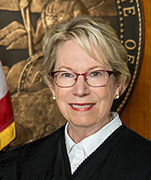 Administrative Presiding Justice Mary J. Greenwood was appointed to the Sixth District Court of Appeal by Governor Jerry Brown in December 2017 and took office upon her confirmation on January 25, 2018. On April 17, 2018, she was confirmed as the Sixth District’s first female Administrative Presiding Justice. Justice Greenwood is a native San Franciscan and graduate of Lowell High School. She received her Bachelor of Arts from Grinnell College, Grinnell, Iowa in 1978 and her Juris Doctor from Hastings College of the Law in 1981. A lifelong public servant, Justice Greenwood has dedicated her legal career to improving access to justice for all Californians. She spent 30 years as a Santa Clara County Public Defender, representing the indigent accused in all aspects of criminal litigation, with a particular emphasis on serious felonies and homicides, including capital murder cases. During her time with the Public Defender Office, Justice Greenwood also took multiple sabbaticals to explore private civil practice at the Boccardo Law Firm and at Coblentz Patch Duffy & Bass in order to increase her breadth of legal knowledge and experience. In 2005, the County Board of Supervisors appointed her to the position of Public Defender. She directed an office which provided representation in approximately 35,000 cases annually and supervised a staff of 250. During her tenure as Public Defender, Justice Greenwood led efforts to reform juvenile justice and reduce youth incarceration. She advised the Board of Supervisors regarding criminal justice policy, and sat on the City of San Jose Mayor’s Gang Prevention Taskforce which worked to abate gang violence. She also initiated a successful effort to provide public defender representation to litigants at all stages of misdemeanor proceedings. Justice Greenwood led the Public Defender Office until her appointment to the bench in 2012, where she served as a judge on the Santa Clara County Superior Court. She sat in the Civil and Family Law Divisions and was selected as Assistant Supervising Judge of the Family Division and as Chair of the Self Represented Litigants Committee. She also served on the Budget, Long Range Planning, Personnel and Executive Committees. Justice Greenwood is married to the Honorable Edward J. Davila, Federal District Court Judge for the Northern District of California. They have one adult daughter. Both Justice Greenwood and her husband mentor law students and attorneys and speak regularly to students and community members of all ages about the importance of the rule of law and public service.